How do satellite galaxies orbit their host? It is well known that the Milky Way has a number of satellite galaxies orbiting it. They seem to orbit the Milky Way within a relatively thin plane and have a common rotation direction. The neighboring Andromeda galaxy also displays this kind of behavior. It is natural to ask, is this coherent rotation of satellite galaxies typical of other galaxies in the Universe? To answer this question, the authors in this paper examine the angular and radial velocity distribution of satellite galaxies around host galaxies using spectroscopic and photometry data from SDSS. Specifically, the analysis focuses on using spectroscopic redshift data from isolated host galaxies (i.e. galaxies significantly brighter than nearby companions) with multiple satellites. To quantify the degree of rotational anisotropy, the authors look at host galaxies that form some preferential axis with a satellite galaxy. This reference axis is defined as the line joining the host galaxy with the brightest satellite. The remaining satellite galaxies are then counted as a function of angle relative to this axis. 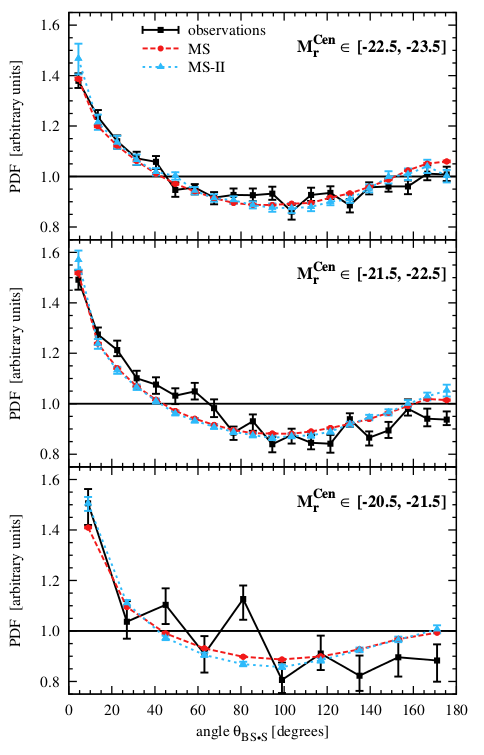 The data show that large anisotropy in spatial distribution around host galaxies, as seen in Fig. 1. Given the obvious discrepancy between the observed angular distribution of galaxies (black curve) and a uniform distribution (horizontal line) in the figure, it is clear that these galaxies are highly anisotropic. Additionally, the authors create simulated galaxy data using a LCDM galaxy formation model, which also show anisotropic satellite galaxy distributions. Fig. 1: This figure shows the angular distribution of galaxies (relative to a reference axis) around their host. The different panels show galaxies in different magnitude ranges. The black curve shows observational data. The solid horizontal lines shows the uniform probability that would be expected if the satellite distributions were isotropic. The red and blue curves are predicted results from simulations. A previous paper (by Ibata et al. 2014) showed that satellites on opposite sides of a host galaxy have anticorrelated (i.e. going in opposite directions, and having the same rotation direction) velocities. This correlation analysis is useful for showing to what extent do satellite galaxies orbit coherently in the same direction, if at all. The authors in this paper try to repeat this analysis, but find that detecting this rotation effect is sensitive to the galaxy sample selection criteria. They then remark that using current observational data to detect this kind of galaxy rotation is not necessarily reliable. The authors also find that there is no excess of correlated (same-direction) velocities for same-side pairs due to systems having satellites rotating coherently around them. The standard LCDM cosmology model predicts that satellite galaxies should have an anisotropic velocity distribution, and thus a relatively anisotropic angular distribution around their host. This is because the motion of satellites around a galaxy is the result of anisotropic infall, so the resulting motions are not entirely random. Initially, the observation that the satellite galaxies around the Milky Way and Andromeda have a relatively flat and coherent rotation structure was challenging to explain within the LCDM framework. However, based on this analysis of a large sample of SDSS galaxies, our galaxy and our nearest neighbour are probably outliers and the galaxies in this paper are consistent with the LCDM model.